Arash Samadi, B.Sc.1, Justin Buro, B.A.1, Daniel O. Lara, B.Sc.1, Matthew A. Wright, B.A.1, Sophia Hameedi, B.A.1, Ashritha Bheemidi1, Alexandra Stern1, Alice Harper, B.A.1, Uri Galili, PhD2, Jason A. Spector, MD FACS1. 1Laboratory of Bioregenerative Medicine and Surgery, Weill Cornell Medicine, Cornell University, New York City, NY, USA, 2Department of Surgery, University of Massachusetts Medical School, Worcester, MA, USA. Radiation is a common primary, adjuvant and neoadjuvant therapy in oncological patients, resulting in damage to the local tissues and permanently compromised wound healing. As a result, surgery in radiated fields are known to have significantly higher rates of complications. It is thought that one cause of impaired wound healing is the muted inflammatory response that occurs in radiated tissues. Humans are continually and safely exposed to the natural antigen α-gal (Galalpha1-3Galbeta1-(3)4GlcNAc-R), and 1% of their antibodies are directed against the antigen. We have previously demonstrated that the topical application of α-gal nanoparticles can significantly accelerate wound healing in both normal and diabetic wounds likely due to accelerated macrophage recruitment. We hypothesized that application of α-gal nanoparticles would similarly enhance wound healing in irradiated wounds. Since mice normally produce the antigen α-gal, α-1,3galactosyltrasferase knockout mice (which do not produce the antigen and therefore can be stimulated to produce antibodies against it) were used in all experiments. Mice were immunized to produce anti α-gal antibodies at titers comparable to those in humans. Dorsal skin was isolated using a low-pressure clamp and was treated with one session of 40Gy. Ten days after radiation two 6-mm bilateral dorsal splinted wounds were generated, which were then treated with α-gal nanoparticles in a 2% carboxymethyl cellulose (CMC) carrier, immediately after wounding and again on postoperative day 1. Control wild type and knockout mice went through similar irradiation and wounding, and were treated with PBS in 2% CMC. Wounds were harvested on days 3, 6, 9, 12 and 15, sectioned, and underwent H&E staining and IHC to determine the extent of keratinocyte migration, granulation tissue deposition, neovascularization and macrophage invasion. Histologic analysis demonstrated blunted keratinocyte migration across all three groups by day 6 confirming the known inhibitory effects of irradiation on wound healing. However, epithelial migration was noted to be greater in the α-gal treated group. 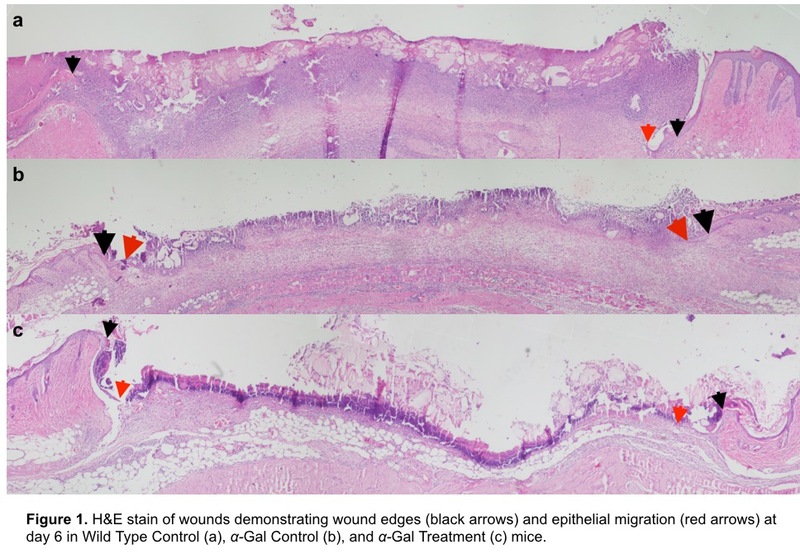 Similarly, in α-gal nanoparticle treated group we observed neovascularization within the wound by day 6; neovascularization was not seen in either wild type or α-gal knock out untreated mice. Analysis of later time points is currently underway. Topical application of α-gal nanoparticles onto wounds in irradiated skin yielded evidence of accelerated wound closure. We believe this naturally occurring agent has great promise for translation in plastic surgery as it has shown promise in the acceleration of healing in both diabetic and radiated wounds.